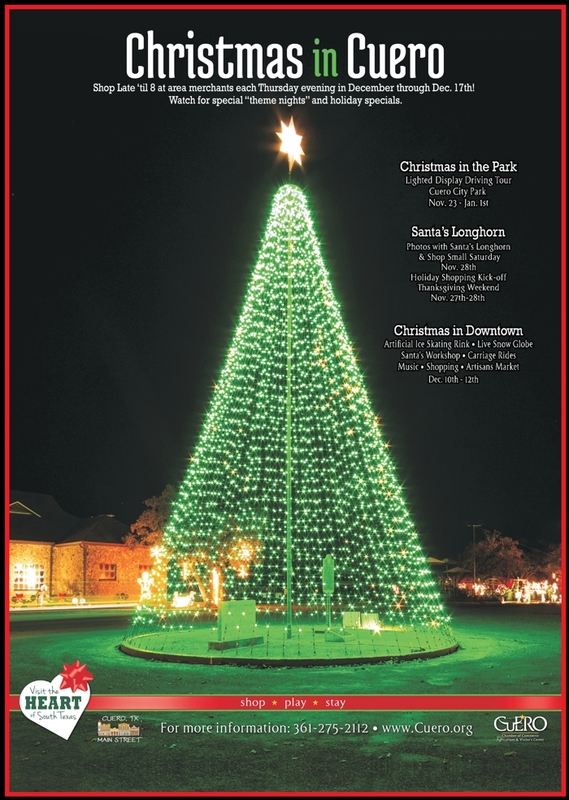 Open nightly the Monday before Thanksgiving through New Year's Day, 6:00 p.m.–10:00 p.m., in Cuero Municipal Park, U.S. Hwy. 87 S. (Broadway). DIRECTIONS: If coming from Victoria, go past the Park Entrance and turn left between TDECU and GVEC; if coming from the west, turn right between GVEC and TDECU; follow the signs to the Park Entrance. CHRISTMAS IN CUERO began in 2000 with lighting of the Gazebo in the Cuero Municipal Park. It has grown to over 130 displays of Victorian, Western, Train, Gingerbread House and other scenes. Highlights are the 17-piece Nativity on the Lake Island, the 85-foot Paddlewheel Boat, “Sassy” the Sea Serpent, “Peace on Earth” Globe, the 30-foot U.S. flag and Penguins. Santa and his reindeer fly over Lakeview Knoll while his elves are busy with gifts in other scenes. Watch Old Man Winter make snowflakes and Santa wish all a good night! Look for the Christmas in the Park Arch at the entrance, the Twelve Days of Christmas, and the Lighthouse on the Lake's pier. The drive through the Municipal Park is a self-guided tour with Seasonal Cutouts and Nutcrackers showing the way. Donations are accepted at the end of the tour. FREE HOT CHOCOLATE NIGHTS are Thursdays in December, the 3rd, 10th, 17th and 24th, 7:00-9:00 p.m.